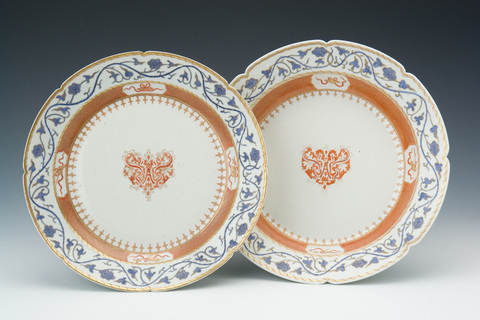 de Gournay's Stafford dinner service is a handsome design typical of early to mid 18th century Chinese Export porcelain. The outer rim is decorated in cobalt blue and gilt scrolling vines, leaves and flowers inside a solid gilt band. The four lozenges, containing traditional scholar's studio implements, are finished inside with a spearhead gilt band.